Please tell your colleagues, residents, fellows, pathology assistants and laboratory personnel about our website.� Please also let us know if you have any suggestions for improvement in 2009. 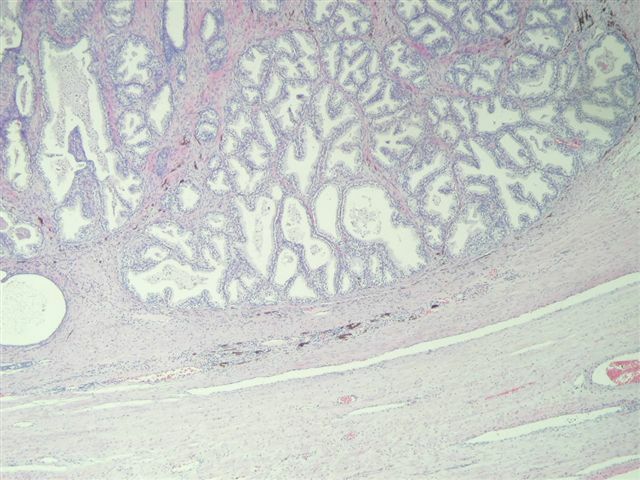 Thanks to Dr. David Cohen, Herzliyah Medical Center, Israel for contributing this case. 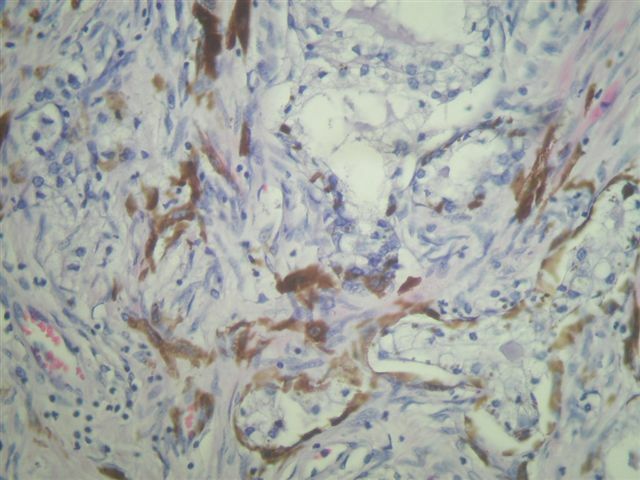 �To contribute a Case of the Week, email NatPernick@Hotmail.com with the clinical history, your diagnosis and diagnostic microscopic images in JPG, GIF or TIFF format (send as attachments, we will shrink if necessary).� Please include any other images (gross, immunostains, etc.) that may be helpful or interesting.� We will write the discussion (unless you want to), list you as the contributor, and send you $35 (US dollars) by check or PayPal for your time after we send out the case.� Please only send cases with high quality images and a diagnosis that is somewhat unusual (or a case with unusual features). 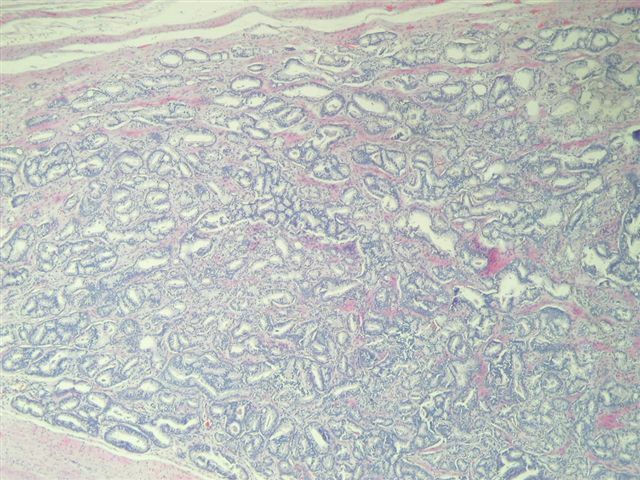 A 72 year old man had a radical prostatectomy for prostatic adenocarcinoma. 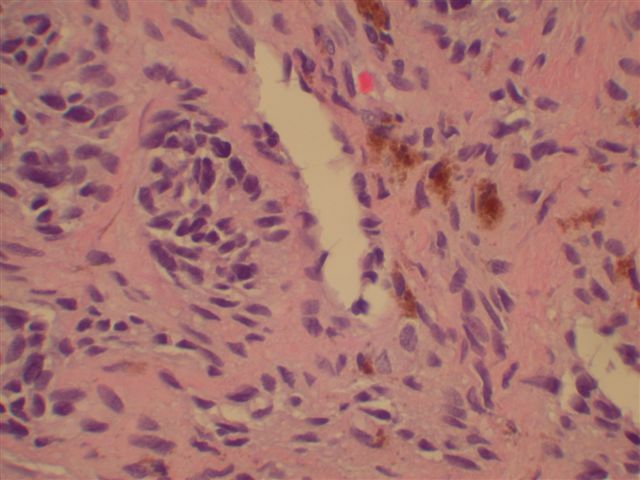 Prostatic melanosis is the finding of melanin within prostatic stromal melanocytes and glandular cells.� The stromal melanocytes are believed to transfer melanin to the epithelial cells (Am J Clin Pathol 1988;90:530).� Prostatic melanosis may be an isolated finding, associated with blue nevus (Eur Urol 1992;22:339) or associated with other prostatic pathology such as adenocarcinoma, as in this case. 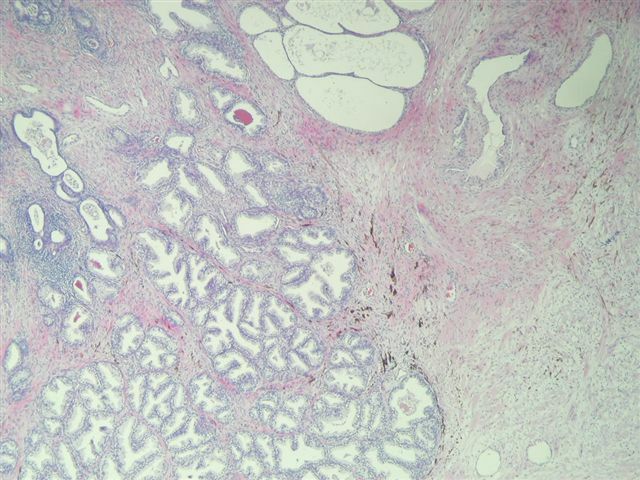 The differential diagnosis includes lipofuscin pigment and blue nevus.� Although lipofuscin is characteristic of ejaculatory ducts and seminal vesicles, it is also found in prostatic epithelium (Am J Surg Pathol 1994;18:446, Mod Pathol 1996;9:791).� It is composed of golden yellow-brown to gray-grown granules (lipofuscin in hepatocytes).� It stains with PAS-diastase, Congo Red, Luxol fast blue, Oil red O and Ziehl-Neelsen.� Both lipofuscin and melanin stain with Fontana-Masson stain, but lipofuscin is S100 negative. 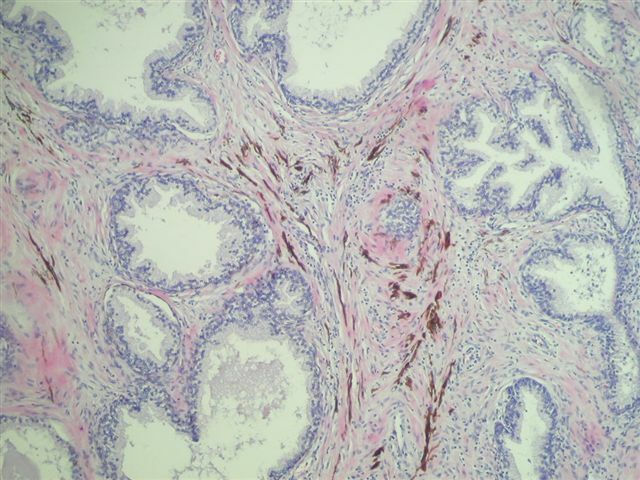 Blue nevus exhibits spindled stromal cells with marked melanin deposition (cellular blue nevus in skin).� Nevus cells without pigment are usually present. 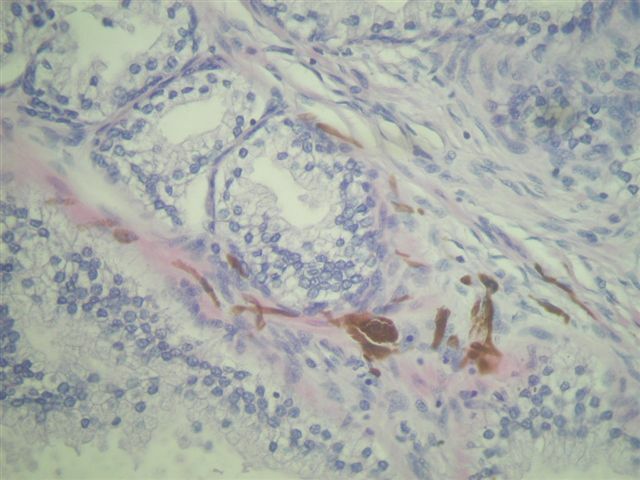 There is no clinical significance to the presence of melanosis in the prostate.